I have always loved Christmas. For me, it is the merriest season of the entire year. One of my favorite part of Christmas is listening to Christmas carols. Today, I will be reviewing the best Christmas carol sing-along app that I have found so far, entitled Christmas Song Machine HD. Bring the Christmas atmosphere to your home with popular carols like Jingle Bells and White Christmas. 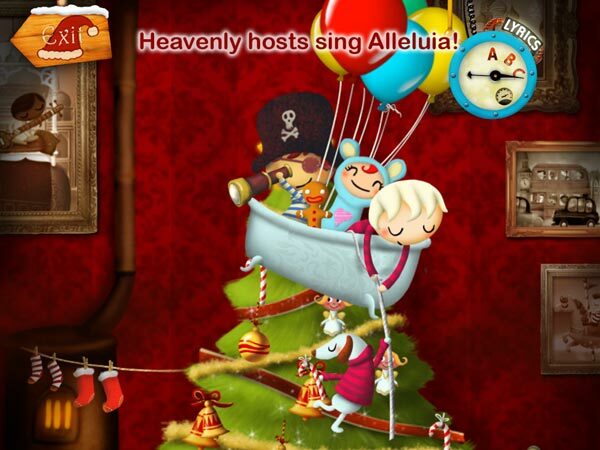 Christmas Song Machine HD is a karaoke app for juniors to enjoy five of the most popular Christmas carols. It has colorful illustrations, eye-catching animations and beautiful songs which I am sure that everyone in your family would enjoy. Instead of simply rushing into the songs, the app begins with a toy factory where you will find two elves happily putting your desired toys inside a box and delivering it to you. Using this metaphor, the app then nicely transitions to the main menu. You can then select the songs you want to sing. In the first song, White Christmas, you will find three kids riding inside a train on a snowy Christmas eve with beautifully decorated houses along the side of the rails. You can turn on/off the lyrics by tapping on the Exit button on the top left corner. I personally find the lyrics to be helpful. Silent Night is the second song to follow. The animation is set in the living room where you will find several kids riding in a balloon-powered bathtub, trying to put toys and ornaments on the Christmas tree. You can tap on the gingerbread man to start decorating. The first cheerful song in this app is Jingle Bells. You will find that the background for this song matches the one in the main menu. Two elves inside the toy factory are busy producing and painting the toys, where another elf is busy transferring the empty boxes -- presumably for packaging the toys as you have seen in the main menu. You can tap on the controller to switch the toys that you would produce, and when the toys have been painted you can still tap on them to change their painted colors. A Christmas app would not be complete without the existence of Santa Claus and Rudolph the Red-Nosed Reindeer. Fortunately, the developer decided to include both of them in the fourth song, Oh Holy Night!. Using John Sullivan Dwight's translation from the original 1847 French poem by Placide Cappeau, you can hear this song being performed by a young girl with a cute and beautiful voice. In addition to this, you can also interact with the gifts that are dropped from the hot air balloon. Simply tapping on the gifts would allow you to see what toys that Santa and Rudolf have prepared for you. Finally, we have the obligatory song, We Wish You a Merry Christmas. Against the snowy backdrop, you can watch kids going outside to play in the snow. It is a beautiful way to end the app and to welcome Christmas. Beautiful illustrations and lively animations set the app apart. As a parent, I really want to introduce both my sons to beautiful Christmas carols that I have enjoyed since my childhood. Christmas Song Machine HD has really helped me with that task. Both Philip and Noah can't take their eyes off the TV when I use airplay mirroring to play the app on my Apple TV. They really love the app. Having kids sing the songs also really help my juniors connect with the songs. The fact that the developers included accurate lyrics really helps to ensure that my sons would learn the correct version of the songs. In addition to the beautiful musical compositions, another feature that makes the app stand out is its charming illustrations and lively animations. The app is very vivid and sure to keep your juniors engrossed for a long time. Sing along to popular Christmas carols. Based on my personal experience scouring the App Store for quality Christmas apps, I can tell you that it is not an easy task to do. Over the past week I have spent tens of hours trying to round up the best ones, and Christmas Song Machine HD is one of the few that I really enjoyed. If you want to bring the cheerful Christmas atmosphere to your home, this is one of the best apps that can help you achieve it. I will be sharing more Christmas apps with you soon, but in the meantime, I highly recommend Christmas Song Machine HD.